Hello! My name is Donna Goode and I'm a writer of historical romance set in South Carolina during the Revolutionary War period and pre-Revolutionary War period. I grew up in the Land of Enchantment but my husband took me away from all that. I've been married—to the same guy—for the past 38 years. He’s a retired Naval officer and we've lived all over the United States. We built our home in the beautiful hills of Northeast Tennessee about eleven years ago and this is where we’ve lived happily ever after. My wonderful husband is my hero—the most wonderful man I’ve ever known. We have one daughter who’s married with a young son of her own and living in a galaxy far, far away—in Northern California. She’s also an author and an RWA member! I’m a registered nurse and have practiced Pediatric nursing for the past twenty years. Pediatrics is my first (nursing) love as historical romance is my first writing and reading love. I’ve been reading it since—pre-birth! My first book was Anderson’s Fairy Tales! My favorite book is Pride and Prejudice. Happily, my copy of it is leather-bound. Unhappily, I’ve read it so many times I’ve nearly worn the gold lettering off its cover! I’m not joking, by the way. I’ve read it at least once each year—and sometimes more than that since I purchased it—in 1977! History has pretty much always been a passion of mine and the Revolutionary War period is perhaps my favorite and is, thus, the setting for my books. Welcome to my world! There were various classes of ladies’ maids—and it pretty much depended on who you were as to the class you hired. There were fine maids and lowly maids, intelligent maids and maids without any affectation of ingenuity. “There were maids who were their mistress’s ‘right hand’ as it were, coadjutors in all that concerns the interest of the household; and maids who were mere automatons, who performed the duties required of them in a mechanical manner” and who were more concerned with their own interest than that of the lady they served (gasp). 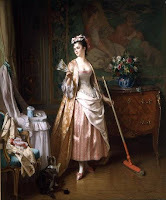 The French lady’s maid was usually hired by the highest ranking ladies in society: ladies who “went out a great deal” and who spent a great deal of money on their wardrobes. This, of course, suggests a large home with many servants. It was said that “a Parisian maid out of her orbit is not a treasure”. In other words, she could make your life quite miserable if she should be hired to serve out of her element. And, don’t even expect her to remain! Let’s consider the task of hiring one of these, shall we? It hardly needs be said that you will be a lady with a nearly unlimited budget for clothing and hiring the best household staff money can buy. And please…remember that your schedule must be full. She will expect it! She will rank second in importance to your housekeeper in the household servants’ hierarchy. She will answer to nobody at all except you—just in case you have a house steward who dares to think he’s actually in charge of her. She will expect to have under-lady’s maids under her command who perform the menial tasks of cleaning your bed-chamber, and sewing, mending, hand laundering and starching your clothing. She will assist you in selecting them if you are not yet in possession of qualified individuals. You may expect her to have a thorough knowledge of dressmaking although she will not actually sew any but your shifts, nightgowns and other intimate garments and your less expensive dresses for day wear—you will, of course, have your couturière design and sew your evening wear. You may certainly expect her to possess experience in doing needlepoint and fine embroidery, washing your fine linen, starching your tiffanies, caring for your delicate needlepoint laces and mending it all when necessary—although she may not perform these tasks herself but assign the task to her under-maids. Possessed of the highest standards, your French lady’s maid will be an accomplished coiffeuse so that you will never be expected to seek the services of another for this service and her skillful application of make-up will leave you looking perfect, no matter the occasion. You will be entirely cared for by her and her staff: your skin, your nails, your bathing, your hair will all receive her personal attention and leave you nothing at all to complain of. She will be on hand to lay out every piece of your complicated wardrobe requirements for the next activity in your busy schedule and will supervise your dressing. She will anticipate your return from your appointment and be on hand to assist you to change for the next one on your schedule. Your chambers will have been cleaned and put into good order in anticipation of your arrival…she will have seen to it. She will assist you to change and bathe before your evening engagements. You will be coiffed and your make-up will be delicately applied to show your best features and hide any flaws—should your perfect complexion possess any. Your perfectly cared-for precious jewels will be brought out for your approval and will be put on you before you leave your chambers. She will also be on hand with at least one assistant when you return in order to assist you to change out of your clothing and prepare you for bed…and your lord’s pleasure. Before she retires she will put away all your clothing and jewels and neaten your dressing room. You may trust her to supervise your entire personal staff and all your belongings. Woe be it to any hapless under-lady’s maid who begs ignorance of one or another of these tasks for she will be certainly be instructed in it! Who would consider hiring such a person for such a coveted position if she didn’t already possess the required skills, I ask you? When you are ill or confined by your pregnancy, she will play music for you and perhaps even sing for you if her voice is pleasant. She will read to you for your amusement. She will be utterly discreet and keep all your secrets—your illnesses, your personal failings (should you possess any, of course), your failed love affairs are all safe with her. If you choose to keep a pet dog or dogs she will see that they are washed, fed and walked. You may assure yourself that she will share your fondness for your dogs! * Is she thoroughly trustworthy, sober and honest? * Is she quick and obliging and kind in illness? * Is she a handy dressmaker, blouse maker and renovator, a careful packer and handy traveller? * Has she a good memory and is she tidy and methodical in her work and duties? * Has she a good temper or is she easily irritated? * Is she thoroughly discreet and not inclined to make friends all over the place, and is she really reliable? * Is her health good and has she good eyesight? * Do you know if she is engaged to be married? The results of this enquiry will determine her fitness for the coveted position she that will be hers should her character be determined to be satisfactory to you. Before you engage her to your staff you must not forget to settle your expectations of her, including her wages, perquisites, dress and hours. If she is to be given your cast off clothing to wear she may only wear them on her afternoons off. She may also sell them to increase her wages. If you choose not to permit this arrangement for your own personal reasons then she will expect to be compensated for the loss of the perquisite. You will find that it is commonly expected by them. You must establish your schedule with her and she will expect to be informed of any changes to it. You must inform her in sufficient time to pack your luggage before your trips to visit friends or family for house parties. She will accompany you to these, of course as will your husband’s valet. It goes without saying that she and her assistants will form part of your retinue when you and your lord retire to your country estate for the summer. She will expect to have her afternoons free while you are engaged upon your appointments so you must not fail to inform her ahead of time if there is a change to your schedule. You will, of course, expect your French lady’s maid to dress stylishly, but simply. You will, of course, not wish her to be as fashionable as you are. She must be pleasant in her appearance at all times. When she accompanies you on your afternoons out nobody must mistake as the mistress. Now admit it, ladies. Doesn’t the employment of a French lady’s maid sound like a lovely prospect? I wouldn't mind having a French ladies' maid, Donna, but I doubt if she'd be qualified to keep all my jeans and sweat pants in good order. Thanks for this interesting post. I enjoyed it! Excellent post Donna! I had no idea a French lady's maid was so coveted as well as having her own staff to command. Seems this would be the perfect job for a woman who had to seek her own fortune. With her assumed discretion and loyalty, knowledge of her Lady's daily schedule and particulars, it would be like purchasing a ready-made friend. Not too bad of a deal considering the climate of treachery most of the society ladies had to wade through. Thanks for taking the time to enlighten us! Very informative post. Would I want a French ladies maid? It almost sounds like too much work to have one. Of course if I were in the upper level of society, it would be a necessity. There certainly wouldn't be enough time to prepare, take care of the details, and keep up with social expectations. We are "neighbors" of a sort. We are retired military living in the hills of NE Tennessee. It is a lovely area. Thanks so much, ladies. I, uh-h-h, think I'd prefer to keep my jeans and sweats clean and put away myself. A lady's maid would turn her nose up at my closet organization. Still--hm-m--maybe I could stand having someone take care of all the little nits like cleaning, dusting, vacuuming... Yes, I think I could stand that very well! Okay, Pat, so where do you live? I'm outside of Johnson City about 18 miles west & nearly halfway to Greeneville...but north of Hwy 11-E about 6 miles. Limestone is simply the post office our mail comes from and bears no resemblance to where we actually live. How funny, we are closer neighbors than I thought. Our post office address is Jonesborough, but we live 10 miles southwest. We are near the Nolichucky. My husband and daughter work at the Chucky Post Office. I work at the Unicoi County Public Library. We live in a victorian farm house with our own set of ghosts. I have been surprised by the number of writers that live in the NC-TN-KY area. It is lovely and the cost of living is better than our home states of NY and FL. Even though I work as the children's librarian, I'm the only one on staff that reads romance, so I end up selecting many of those books. I started checking websites of authors I was familiar with and have discovered some nice sites and many more authors. The history sites have been wonderful. I've found many new to me authors and am trying to read them all. Unfortunately, my reading time has suffered from the time spent on the computer. I just discovered RWA and since the convention will be in Nashville next year, I will go if I can get the time off. Will go early and volunteer if I can. Best of luck with your writing. I'll be looking for your books. Excellent post Donna!!! I would LOVE to have a lady's maid :) and a housemaid for that matter--I hate to clean!